Before deciding . . .
Do you make different models? Not really, but I'm constantly tweaking it. I currently have a second size for low fingerboards and can make some small adjustments, so let me know if you have a request. Why haven't I seen similar pickups before? You tell me. I doubt I would have made this pickup if I could have bought one. Do I have to get rid of my current pickup? No! Absolutely not!!! The two pickups shouldn't interfere with each other, and the sound quality will be different enough that if you've already got an expensive piezo-pickup you'll probably enjoy having both. Will it work with my violin? Your violin needs to have a standard fingerboard with a gap between the fingerboard and the violin reaching ****. Do you have a shop or give public demonstrations? I don't have a shop. I had a booth at Southern Music Rising in Monticello, FL, April 20-21, 2012. If you'd like to try the pickup yourself, you are in luck, because I am currently looking for people to critique them for me. Please contact me for details. Before playing . . .
2. An amp with a 1/4" input jack. 3. Speakers for your amp. 4. (Optional) A pre-amp for added integrity and volume. You do NOT need batteries or an extra power source. Probably not as breakable as your violin. The copper coils under the cloth tape are fragile and care should be taken not to hit or rub the tape. The coils are potted in wax, so they'll be fine under normal use, but should they be broken due to excessive force, the pickup will be useless. The wood is about as breakable as it looks. If you're testing a pickup for me and it breaks, please do not hesitate to tell me. What about humidity and foul weather? 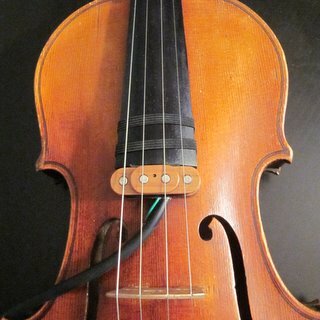 In general, please treat this pickup the same way you treat your violin. Don't drop it or handle it roughly. Don't expose it to temperatures that would melt wax. Don't leave it in extreme cold or damp conditions that might warp the wood or damage the integrity of the glue. It contains small amounts of solder which shouldn't be thrown out in the regular trash, but most people do anyways. What is the little wire sticking out beside the instrument cable? It looks crooked; why are some magnets sticking out from the top? To achieve the best balance from most violins, the overall shape of the pickup is meant to match the profile of a typical bridge; however, the shape of the magnetic fields and the weight and tension of the strings all effect signal strength. For example, experience has shown me that the D string especially tends to need a little boost and so this magnet protrudes accordingly. Many guitar pickups also have a staggered profile. I've coated all magnets with glue to prevent direct contact. Please do not try to file or cut the magnets because they may chip or break. First use . . . If it is just barely touching the strings wiggle it around or move it slightly out from under the fingerboard towards the bridge. If it still touches you can double the thickness of foam on the pickup. Be careful and try it out before exposing the adhesive; this stuff is hard to undo. One of the strings is not making any sound through the pickup. Check that the string is made of steel or nickel. 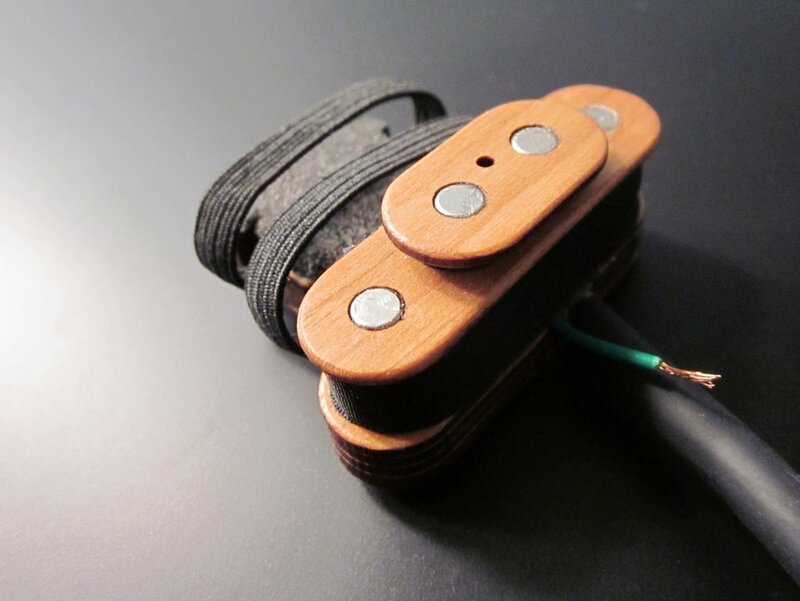 Just like an electric guitar, the strings must be ferromagnetic for the pickup to function. The sound is too quiet! Yes, these pickups generate a weak, but very clean, signal. You will need an amp or even a preamp and an amp between your pickup and your speakers. If any of your strings are too loud/soft (but still making sound) or if you wan to shift the tone towards the E string or G string, just shift the pickup and push the elastic bands in place to hold it where you think it sounds best. Can I use effect pedals with it? Yes, please do! You will probably want to add a preamp or treat the signal as a microphone before you run it to any pedals. Reverb and chorus are probably the most commonly-used effects with the violin, but I also recommend trying a little overdrive and certainly a loop pedal. I want to sound like a metal guitar! Play double stops with fifths and sixths. Try short bow strokes that start and stop off of the strings so that the strings can resonate. Get a reverb pedal and an overdrive pedal or a tube amp. Turn down the treble on your amp. Get rid of your preamp. You may also want to learn how to rehair bows to save yourself some money. I don't want to sound like a metal guitar! Get a preamp to help maintain sound integrity. 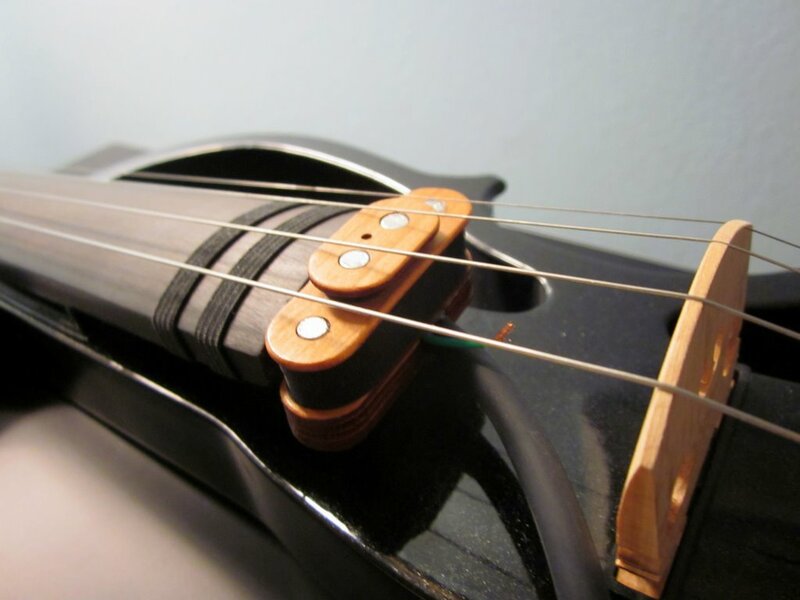 This pickup will remove all mechanical sounds such as your hand on the fingerboard or the subtle sounds of bow changes, so try playing a little over-dramatically. That said, this pickup will never sound like an acoustic violin. It's not supposed to.